I’m making some sheet metal enclosures for a project but I don’t have a press brake in the shop so I’m building them by welding the individual pieces. One of the parts has some narrow strips for stiffening and I could not get clamps in to hold the stiffener. Kant-Twist makes some edge clamping 3-jaw clamps but only in the larger 6″ size. 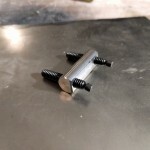 I though about taking my smaller 2″ clamps apart and adding the third jaw, but came up with this simpler solution. 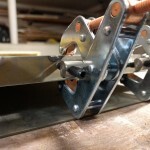 I used some short sections of 1/2″ CRS and some swivel pad 1/4″-20 set screws to make my edge clamps. After the Kant-Twist clamp is secured, these are inserted and nestle in the crook between the jaws. 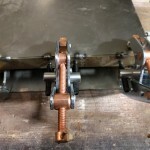 The setscrews are tightened to secure the edge strip for welding.